Since it is the single-largest government program, not only in the United States but also the entire world, it’s remarkable that Social Security isn’t getting much attention from fiscal policy wonks. Sure, Obamacare is a more newsworthy issue because of the repeal/replace fight. And yes, it’s true that Medicare and Medicaid are growing faster and eventually will consume a larger share of the economy. But those aren’t reasons to turn a blind eye toward a program that will soon have an annual budget of $1 trillion. Especially since the tax-and-spend crowd in Washington is actually arguing that the program should be expanded. I’m not kidding. If nothing else, the just-released Trustees Report from the Social Security Administration demands attention. As I do every year, I immediately looked at Table VI.G9, which shows the annual inflation-adjusted budgetary impact of the program. Here’s a chart showing how the program has grown since 1970 and what is expected in the future. 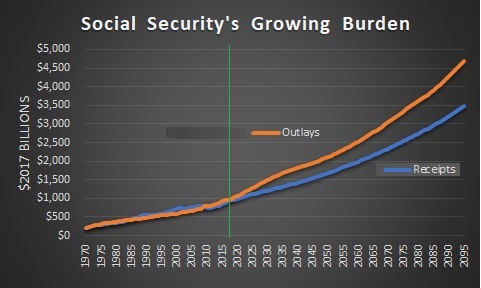 Remember, these are inflation-adjusted numbers, so the sharp increase in outlays over the next several decades starkly illustrates that Social Security will be grabbing ever-larger amounts of money from the economy’s productive sector. It’s also worth noting that the program already is in the red. Social Security outlays began to exceed revenues back in 2010. And the numbers will get more out of balance over time. By the way, some people say that the program is in decent shape since the “Trust Fund” isn’t projected to run out of money until 2034. That’s technically true, but utterly meaningless since it is nothing but a pile of IOUs. You don’t have to believe me. A few years ago, I quoted this passage from one of Bill Clinton’s budgets. These balances are available to finance future benefit payments and other trust fund expenditures–but only in a bookkeeping sense. …They do not consist of real economic assets that can be drawn down in the future to fund benefits. Instead, they are claims on the Treasury, that, when redeemed, will have to be financed by raising taxes, borrowing from the public, or reducing benefits or other expenditures. This is why annual cash flow into and out of the program is what matters, at least if we care about the Social Security’s economic impact. And for those who want to know about the gap between the inflow and outflow, here’s a chart showing how deficits are going to explode in coming decades. Again, keep in mind these are inflation-adjusted numbers. That’s not a typo in the chart. 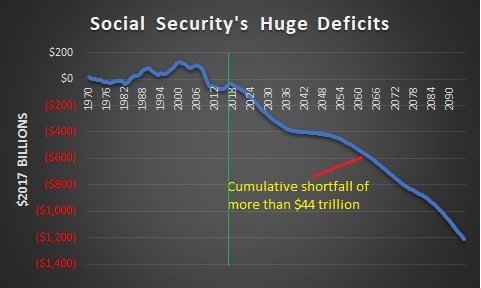 The total shortfall between now and 2095 is a staggering $44.2 trillion. Yes, trillion. Remarkably, there’s an even bigger long-run problem with Medicare and Medicaid. Which helps to explain I relentlessly push for genuine entitlement reform. But let’s focus today on Social Security. The answer to this looming fiscal nightmare is to copy one of the many nations that have shifted to “funded” retirement systems based on real savings. I’m a big fan of the Australian approach. Chile also has a great system, and Switzerland and the Netherlands are good role models as well. Hong Kong and Singapore also rely on private savings for retirement, and both jurisdictions demonstrate that aging populations and falling birthrates aren’t necessarily a fiscal death sentence. Heck, even the Faroe Islands and Sweden have jumped on the bandwagon of private retirement accounts. P.P.S. You can enjoy some Social Security cartoons here, here, and here. And we also have a Social Security joke if you appreciate grim humor. Social Security is, and always has been, an inter-generational transfer of wealth. The taxes paid by today’s workers and their employers don’t go into dedicated individual accounts (although 32% of Americans think they do, according to the 2014 Pew Research survey). Nor do Social Security checks represent a return on invested capital, though you might be forgiven for thinking so since the “personalized Social Security statements” that used to be mailed out once a year and now are available online detail your payment history and projected monthly benefits. Rather, the benefits received by today’s retirees are funded by the taxes paid by today’s workers; when those workers retire, their benefits will be paid for by the next generation of workers’ taxes (caveat: see Point 3). Your benefit amount is based on your earnings history and age at retirement, not on how much you and your employer paid in Social Security taxes (although for most people, taxes paid are closely tied to their earnings). We thought this reader raised an interesting question: Are Social Security and Medicare payments actually a “partial refund” of what the beneficiary has already paid in? So we took a closer look. A two-earner couple receiving an average wage — $44,600 per spouse in 2012 dollars — and turning 65 in 2010 would have paid $722,000 into Social Security and Medicare and can be expected to take out $966,000 in benefits. So, this couple will be paid about one-third more in benefits than they paid in taxes. Other couple do a lot better depending on earnings. Generally, the lower one’s earnings, the greater the multiple of benefits received compared to contributions. This overpayment isn’t interest. Social Security funds received now or in the past are not invested in anything normal. The Treasury has taken the funds into the general fund and deposited special Social Security Bonds which are only a political promise. These may be defaulted at any time, as can the Social Security program. It is all a political promise. So, our government has decreed that the young will pay to the old, forever. That is theft, no matter how happy one might be to in turn steal from the young in the future. Andrew_M_Garland… While I agree that Social Security is a giant Ponzi scheme, I disagree that the old will ‘steal’ from the young. The ‘old’ have paid into the fund their whole life, with full expectation of receiving a return on their investment. And, the ‘old’ gave birth to, protected and supported the ‘young’ until they could and would stand on their own two feet, which can be into their 20’s, 30’s, 40’s (hell, some ‘young’ never do). So, really, it’s payback! Nothing in life is free. You pay for everything… one way or another! Social Security is the miracle of stealing more and more from each generation to forcibly pay to their parents, or to someone else’s parents. Each generation which pays is given permission in turn to take from the next generation. This is a policy of enslaving the young by promising them the right, in turn, to enslave their young. This a Ponzi scheme with forced contribution. The scheme will come to an end leaving millions without their own resources and unable to steal their retirement from the wized-up young. It guarantees a social distopia and class war. Socialists have implemented much ofthe dystopia imagined by George Orwell in the novel “1984”. [edited] Already we are breaking down the habits of thought which have survived from before the Revolution. We have cut the links between child and parent, and between man and man, and between man and woman. No one dares trust a wife or a child or a friend any longer. But in the future there will be no wives and no friends. Children will be taken from their mothers at birth, as one takes eggs from a hen. Always there will be the intoxication of power, constantly increasing and constantly growing subtler. Always, at every moment, there will be the thrill of victory, the sensation of trampling on an enemy who is helpless. That boot is the permission and requirement that the old will steal from the young for as long as they are able. The politicians of Social Security, F.D.Roosevelt et al, received a lifetime of re-election and adoration. The theorists, also dead, received their Marxist joy at knowing that they had created a wave which would destroy the US in 100 years. The economists, such as Paul Samuelson ( http://consultingbyrpm.com/blog/2012/10/callahans-unsustainable-attacks-on-nick-rowe.html ), wrote nonsense about the miracle of compound interest, when the reality was the “miracle” of a growing population and a classic Ponzy Scheme on a grand scale. Samuelson joyfully calls it a Ponzy scheme. Social Security was a lie from the beginning. It was sold as a forced savings program. People would pay in, the miracle of interest would apply, and they would receive their own money back during retirement. It never operated that way. People wanted to pay less than needed and receive more than deserved. Politicians were happy to sell the idea that people were receiving back their own money, and so would always demand the payments. There is a serious problem projecting out that far. The pool of recipients includes people who won’t be born for another 10 years, or who won’t start paying FICA for another 30. Even politicians wouldn’t be stupid enough to continue the program in its current form. I’ve always loved the references to the social security trust fund.It amazes me that none of my liberal friends believe me when I tell them it’s unfunded. Ignorance seems to be bulletproof.